Welcome to Brown Acres Farm! Check in fast and efficient. Room looks to be updated. Room clean. Bed comfortable. Parking lot clean. The most beautiful suite with lots of space and tons of things to keep you occupied including a private movie theater!!! Kathy and Sean are so welcoming and breakfast in the morning was amazing!!! Where to find Greenwood hotels near an airport? Where can I find hotels in Greenwood that are near tourist attractions? Expedia's extensive Canada accommodation database offers 6 hotels within a 0.1-kilometre (0.06-mile) radius of Greenwood. The Ramada Limited Grand Forks, British Columbia, which is the nearest accommodation, lies 17 kilometres (10 miles) from downtown Greenwood. 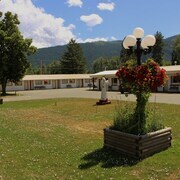 Also, you could investigate the Riverside Motel, located in British Columbia, which is 19 kilometres (12 miles) away. 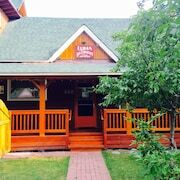 18 kilometres (11 miles) from the heart of Greenwood, is the Luna Bed and Breakfast. Alternatively, the Noble House Suites is positioned 18 kilometres (11 miles) away. Two more options include the Western Traveller Motel and the Natasha's Russian Guesthouse. 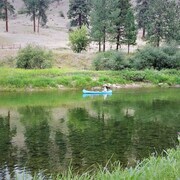 After you have enjoyed Greenwood, set out to explore the other attractions in the Thompson Okanagan area. Thompson Okanagan boasts rural landscapes and beaches. Popular Thompson Okanagan tourist sites include old towns. Locals and visitors alike in this part of Canada commonly enjoy snowboarding, skiing and cross-country skiing. 75 kilometres (45 miles) to the north of Greenwood is Big White, where you can explore Ridge Rocket Express and Bullet Express. Should you wish to stay in Big White, check Expedia's booking pages for the latest deals at the Stonebridge Lodge and Sundance Resort. 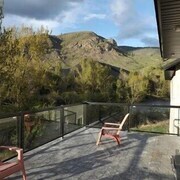 Alternatively, you could stay in Naramata Bench, 85 kilometres (52 miles) to the northwest of Greenwood, where you'll find the OK Whistle Stop Bed & Breakfast and Above Naramata Bed & Breakfast. The Lake City Casino and Black Widow Winery are popular points of interest to see for those visiting Naramata Bench. If sport is a favourite pastime, make the time to visit South Okanagan Events Centre, which is 80 kilometres (50 miles) to the northwest of Greenwood. Sleep nearby to the action at the Royal Bed And Breakfast or the Penticton Lakeside Resort, Convention Centre & Casino. For visitors who choose to fly, Trail Regional Airport is the preferred airport for Greenwood. 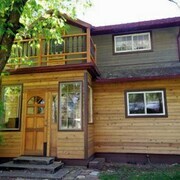 Nearby is Columbia Gardens Winery and Grape Escape Guesthouse. What are the most popular Greenwood hotels? Are there hotels in other cities near Greenwood? 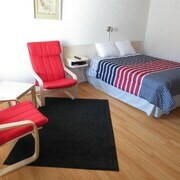 What other types of accommodations are available in Greenwood? Explore Greenwood with Expedia.ca’s Travel Guides to find the best flights, cars, holiday packages and more!